Want to work on your skills and technique? Want to add some variety to your drum sound? There is a huge range of drum pads out there, ranging from super cheap to full-featured beasts. Read on for a comprehensive review of the best drum pad options available. The secret to good chops is practicing. That’s it, there’s no shortcut. It’s critical to practice as much as possible, and on a real kit, if you can. However, it’s not always possible or practical to use a real drum kit every time you practice (and sometimes it’s better not to!). To maximise your time, and to ensure you keep progressing with your skills, you’ll need a drum pad. You can spend a little or a lot, depending on your requirements… Just make sure you have one! When it comes to drum pads, you have are two options: Practice drum pads (designed simply for practicing! ), and electronic drum pads, great for both practicing and adding some great variety to your live sound. We’ll cover each of these in detail, looking at the best products available in each category and how you can use them. There’s a lot of junk out there, so we’ve made sure that everything featured on this list is top quality, and is built for real drummers. Practice drum pads are the most basic option, but don’t let the word basic put you off. Whether you’re a beginner or a drumming pro, you’ll need a practice pad for rudiments, to build technique, and to improve speed. Practice drum pads are usually a flat round rubber pad, with a rebound designed to replicate the feel of a real drum. The word “replicate” is sometimes used loosely here… There are so many different practice pads out there; some which do a great job at replicating a real drumhead, and others not so much. As well as rubber practice pads, there are also mesh drum practice pad options available – these are much lower volume than rubber, and usually have a more realistic feel. To play them, most drum pads can be either mounted to a stand, held with a snare drum stand, or played on your lap or table-top. Most practice drum pads can also sit on top of your snare drum, acting as a drum mute when you’re sitting at your kit. So why get a practice drum pad? You can practice (almost) silently, anywhere, without needing a real drum kit. You’ll save your ears, keep your neighbours happy, and you’ll hear each stroke on the pad a lot clearer than on a real kit. That last point is important, so take note, because it will help you improve your timing and accuracy. Practice drum pads are also perfect for practicing rudiments while you’re doing other things… Sit in front of the TV and work on your chops for hours. Use a metronome, and track your progress to get the best results (for example, slowly try to increase speed while staying accurate). 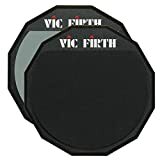 If you need some ideas on what to actually do with your practice drum pad, click here for a list of the most important drum rudiments from Vic Firth. One of the best practice drum pads is the DW Multi-Surface drum pad. This practice pad is extremely versatile, coming with three different playing surfaces in one. One side has a white and grey area, replicating the feel of a snare drum and cymbal. The grey area is the hardest surface, giving a sharper stick rebound and sound. The white surface is a little softer, with a more subdued sound. These two surfaces are useful to hear different sticking patterns much more clearly (for example, when working on complex hi-hat and snare grooves). Turn the DW drum practice pad over, and there’s a soft side designed for building endurance. The reduced rebound on the soft side means you rely less on the drum and more on your own technique for a good stick rebound. Most other drum practice pads have just one surface, so the three different options on the DW practice pad gives you plenty of versatility. The three surfaces are great for definition between different strokes, and the softest surface is perfect for when you need to be extra quiet when working on your technique. For a great mesh drum pad, the Sabian Quiet Tone Mesh pad is the best choice. Sabian normally make cymbals, but they’ve done a great job with this drum pad. Importantly, Sabian’s mesh drum practice pad is super quiet (much quieter than rubber). It can be tuned, which means you’ll have full control over the amount of stick rebound. You can to tune the Sabian Quiet Tone pad tight for a sensitive playing surface, or really low for building more strength and endurance. As a bonus, these mesh practice pads have a really good price, and solid build quality. The Sabian Quiet Tone mesh drum practice pad can be mounted to a snare stand, played on your lap, or on a table-top thanks to its non-slip rubber feet. Tip: Don’t have a practice drum pad? Use a pillow instead: for super silent practicing and strength building. Even if you DO have a practice pad, playing on a pillow is a great workout for your hands. If you want something more versatile than a rubber or mesh pad, there are also some great electronic drum practice pads out there. These come with a lot of built-in features to help you improve your speed, accuracy, and technique. For the ultimate practice drum pad, check out the Roland RMP Rhythm Coach – a mesh electronic drum practice pad with a huge range of features. These things are a little more expensive, but worth it if you’re serious about your drumming. The mesh drumhead is quiet, tunable, and has a very real stick feel. 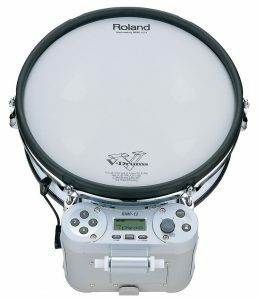 The Roland RMP electronic practice drum pad has a built in metronome, and a great range of built-in drum sounds. An extremely useful feature is “time check”, which tracks and records your accuracy (even giving a score). The metronome has a quiet mode where it intermittently mutes, a great test for your sense of timing. For building speed, the metronome can be set to slowly speed up over time. 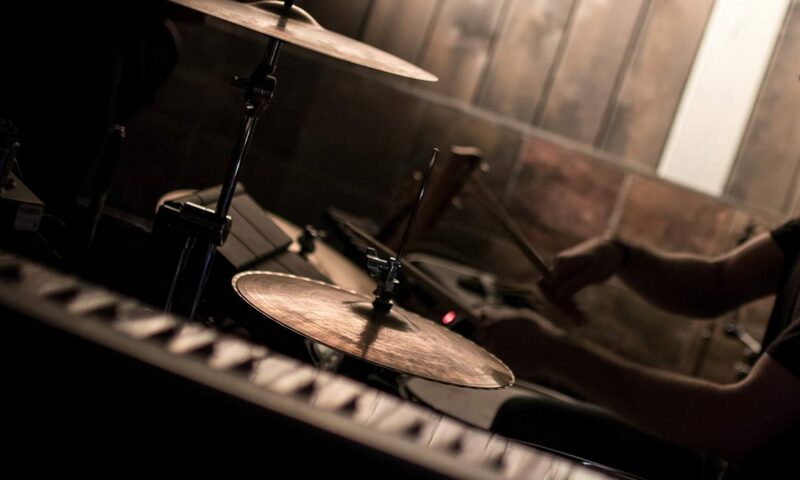 These features are amazing for improving your drumming skills. As a huge bonus, you can attach a bass drum pad and cymbal pad, to turn this into a miniature electronic drum kit. The added pads make this perfect for small gigs, or for an ultra realistic minimal electronic drum practice pad setup. Roland’s RMP electronic drum practice pads have an enormous range of other features as well. Take a look at Roland’s page, or see the video below for more details. Tip: Check out the electronic drum pad section of this article (below) for more electronic drumming options. The drum pad options above are great for practicing with your hands, but what about your feet? Never skip leg day. 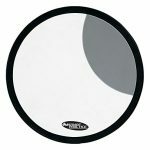 To practice your bass drum technique, there are some great bass drum pad options available. For something cheap but still extremely functional, the Gibraltar GBDP bass drum practice pad is perfect. This is a basic option with good build quality and a fairly realistic bass drum feel. You don’t need to spend a huge amount here, and unless you’re an extremely heavy hitter, Gibraltar’s bass drum practice pad is more than enough to master your pedal technique. 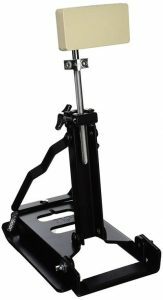 Importantly, this practice pad can accommodate both single and double bass pedals. For a more advanced bass drum practice pad, the DW Steve Smith practice bass drum pad is one of the best options out there. This practice bass drum pad feels great, and is built very solid. Like Gibraltar’s option, DW’s bass drum practice pad is also deigned for both single and double bass drum pedals. The height of the pad is adjustable, and it can be folded away to take anywhere, or to save space when not in use. 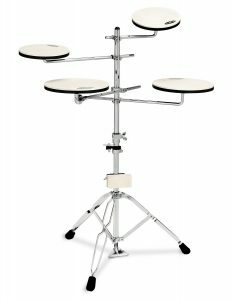 Tips: For tight double-bass drum technique, practice your rudiments with your feet on one of the above pads. Combine one of the above bass drum pads with a drumstick practice pad to build great arm and leg independence. 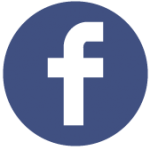 Check out our article on dynamic independence on the drums to master your limb dynamics… There are great exercises here for beginners right up to advanced drummers. Tip: If you’re interested in electronic drums, check the prices of Yamaha and Roland electronic bass drum pads. 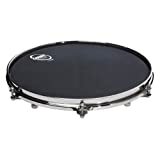 These are sometimes a similar price to some of the practice bass drum pad options. They’re great to practice with, and can double as an electronic bass drum pad if needed. If you want to work on your movement around the kit as well as your stick and foot technique, a full practice pad drum kit is the answer. These practice kits take regular drum practice pads to the next level. A great full practice kit is the DW Go Anywhere Drum Pad Set. This practice drum pad kit is very versatile, very adjustable, and has great build quality. The DW Go Anywhere practice kit is the best option if you need an ultra portable drum pad practice setup, with a very small footprint. This practice drum set can also be expanded with extra drum pads, to create a more custom drum pad kit that suits your needs. Importantly, the rubber pads feel good under your sticks, and they have a nice responsiveness. This kit also partly folds away to take up less space when you’re not using it, and everything attaches to the one stand. This practice pad drum kit is easily adjustable, and also has an attachment for your bass drum pedal (fitting both singe and double bass pedals). DW is one of the most respected names in drum hardware, and they’ve built a solid piece of practice equipment here. Tip: You can also convert your acoustic kit into a silent practice setup with mesh drumheads and low volume cymbals. For something more advanced than simple rubber or mesh pads, there are a huge range of electronic options. These can be used both for practicing, and to add some great variety to compliment your acoustic drum sound. Many electronic drum pads can be expanded, to create a full electronic drum kit that requires minimal space. 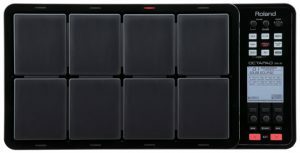 Another great feature is the ability to connect these electronic drum pads to a computer. Using software like EZDrummer, BFD, or Battery, you can have an unlimited range of sounds, ranging from ultra-realistic drum kits to twisted electronic samples. As well as being played live, the more advanced electronic drum pads can also be used like drum sequencers to program drum beats. 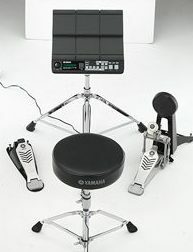 Yamaha and Roland are the two big players in the electronic drum pad world, and both make very high quality equipment. Below are some of the best options for a compact electronic drum pad setup. All of these devices can be expanded with extra electronic pads or pedals, to build a very realistic low volume electronic setup, or an ultra portable gigging set. 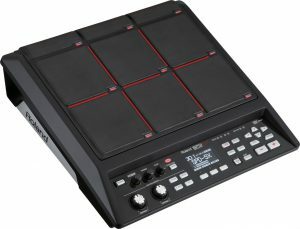 Roland’s SPD-SX is one of the most-used professional electronic drum pads in the world. And for good reason – this is a powerful drum pad that has a huge range of features. The SPD-SX has nine electronic pads, which can be used to trigger on-board sounds or your own samples. If you’ve been to a few live shows lately, chances are that at least one of the drummers had an SPD-SX alongside their acoustic kit. Yamaha’s DTX Multi-12 is very similar to Roland’s SPD-SX, but with 12 pads instead of nine. Like the SPD-SX, Yamaha’s multi-pad is also a serious piece of drumming gear, with some top features that are designed specifically for drummers and percussionists. Both of these Roland and Yamaha drum pads have additional inputs, where you can connect a hi hat pedal and other electronic drum pads (including a bass drum pad), to build a full-featured and super realistic feeling mini electronic drum set. Both of these electronic drum pads also have advanced multi-effects systems, allowing you to add effects and warp the samples you’re triggering. These two pads also connect to a computer via USB, making it extremely simple to use computer-based drumming software. For the ultimate low-footprint electronic drum practice setup, both the Roland SPD-SX and Yamaha DTX Multi-12 are excellent choices. The SPD-SX has more storage for samples (4 gigabytes vs. 64 megabytes). The DTX Multi-12 has more advanced pad layering options (for example assigning up to 4 samples per pad, cycling through them, combining them, or triggering them depending on velocity). The Roland SPD-SX cannot do this. The Roland SPD-SX has an easier-to-use menu system, while the Yamaha takes a little time to master. The DTX Multi-12 is cheaper than the SPD-SX, even though both are professional-level models. The SPD-SX can record samples directly onto the drum pad (both models also have USB input). The Yamaha DTX Multi-12 accepts a USB memory stick to load samples. Roland SPD-SX vs. Yamaha DTX Multi-12: So how to choose? The Roland SPD-SX is the best option if you plan on triggering lengthy samples (e.g. backing tracks), and if you want an easy-to-use menu system. Go with the Yamaha DTX Multi-12 if you want more drumming versatility and don’t mind learning the menu system. This is more of a drummer’s drum pad. While the Roland SPD-SX and Yamaha DTX-Multi-12 are two of the best (and most versatile) electronic drum pads around, there are also some other great options. Depending on your needs, the pads below can be perfect for both practicing and playing live. Roland’s Octapad is the best option if you don’t need to trigger your own sounds. It comes loaded with hundreds of on-board samples, giving you a huge range of drum and percussion instruments at your disposal. The Octapad can be expanded with extra drum pads and pedals, to turn it into a more realistic feeling small electronic drum kit. It also has a great built-in effects system to customise the built-in sounds. The Octapad is extremely well-made: it’s designed to take a beating, and can handle constant gigging. 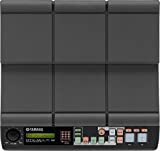 Comparing the Roland Octapad vs. SPD-SX or Yamaha DTX Multi-12, the key difference here is that the Octapad does not allow you to use your own samples. However, the Octapad comes with hundreds of top quality built-in sounds, and this device has everything you’ll need to get creative both at home or with a band. Alesis have some good options if you don’t want to spend big money on a Yamaha or Roland drum pad. The Alesis SamplePad 4 has four electronic pads, plus the option to add an extra dual-trigger pad. If you don’t need a huge range of pads, this is a great choice. 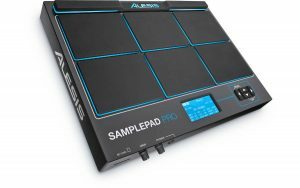 The Alesis SamplePad Pro has eight electronic drum pads, plus inputs for hi hat, kick, and two other drum pads. These Alesis models are more basic compared with Roland and Yamaha’s options (for example less effects, and no metronome or recording). Importantly though, both of these Alesis models allow you to trigger your own drum samples. If you’re looking for a cheaper option or don’t need a huge range of features, they are definitely worth checking out. Want a unique custom drum pad that stands out from everything else? Take a look at Diamond Electronic Drums – they build custom electronic drums in a range of sizes, and with great finishes. 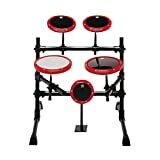 Their custom electronic drum pads are very well built, and have excellent trigger response. Everything is hand made, and they can build anything from a single custom drum to a whole custom electronic drum kit. Another option for custom drum pads are Laurin Electronic Drum Pads. This company also does quality work, and you can order your custom electronic drums in a range of great finishes. Promark used to make custom drum practice pads, however it seems like they no longer do this. If anyone finds a source for custom drum pads to practice on, get in touch!